The new Toyota Avensis offers a fuel-reducing transmission. Toyota hopes that the more-upscale positioning of its redesigned Avensis will give it a boost in a key segment. We have aimed for the new Avensis to be at the cutting edge of the upper-medium segment, said Takoshi Yamamoto, the cars chief engineer. Designed in France and assembled in England, the third-generation Avensis is the first car in its class to offer an optional continuously variable transmission. The CVT is offered with both the 1.8- and 2.0-liter gasoline engines. Toyota expects a 20 percent installation rate for the CVT. Toyota says the CVT, which was developed with Japanese transmission maker Aisin Seiki, helps reduce the 1.8-liter variants average CO2 emissions to 157 grams per kilometer. That is 16 percent less than the 1.8-liter version of the previous-generation Avensis with a traditional automatic transmission. 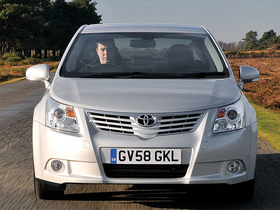 Other Avensis improvements include better materials for the interior and better soundproofing. Overall, the upper-medium segment is expected to be down in western Europe to about 1.1 million units in 2008, from about 1.5 million in 2005, according to market analyst R.L. Polk & Co. Europe. Despite the decline, the class remains important because of the good margins earned compared with smaller models. Carmakers charge higher prices for these cars because they are the larger, more advanced models in their lineups. The segment also is important because demand for upper-medium cars is rising in eastern Europe and Russia, where Polk expects sales of 510,000 units in 2008, compared with 260,000 in 2005. Toyota expects high demand for the Avensis in Europe and Russia will lead to total sales of more than 100,000 units this year, up slightly from about 98,000 in 2008, said Duncan McMath, general manager product planning at Toyota Europe. The current model had a 28.3 percent sales decline to 67,433 units in the first 10 months, according to market researcher JATO Dynamics. The car ranks fifth in the segment in western Europe. The top seller is the Volkswagen Passat.